Learn how to paint animals on rocks in this free nature craft tutorial. Painting in the round has enjoyed a resurgence in popularity over the past few years and many people are immortalizing their much-loved pets in this medium. It’s a great pastime for the hobby painter who is just starting out or the professional artist who is looking for a new and exciting avenue to further their art. Finding rocks to turn into an animal is one of the most exciting parts of this craft. Taking a trip to the river or down to the beach can turn into a safari, hunting for just the right canvas. Stones that look like cats curled in a furry ball, sleeping puppies, rabbits, even hedgehogs, all lie waiting to be discovered by the imagination. 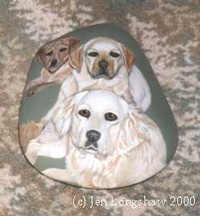 Even flat rocks can be useful for painting 2D “portraits” where the picture is painted only on one side. If it isn’t possible to find rocks “in the wild” then stones can often be purchased from landscaping businesses. Acrylic paint is the ideal medium for rock painting both for its durability and quick drying time. Artist’s acrylics can be used but there are also ranges of folk art paints that are suitable. If the stones are to be left outside exposed to the elements there are some brands that weather extremely well. As rocks are unforgiving canvases synthetic paintbrushes are the best variety to use being both tough and cheap. The rough surface of the stone will eventually destroy any brush although washing them clean in water immediately after use and laying them on a flat surface to dry will mean that they last slightly longer. Some artists recommend soaking brushes in alcohol to loosen paint caking the ferrules and bristles although they should never be left standing in the solution. And even when the brush is reaching the end of its useful existence it can still be resurrected to create certain effects such as fur lines. Before beginning to paint, the stone should be scrubbed thoroughly with detergent and water so that any dirt is removed. It is often advised that it should be left for several days to dry so that the paint won’t eventually flake or bubble. To speed the drying process many painters recommend baking rocks in an oven but this should be undertaken with care. If a smooth surface is preferred wood filler can be used to even out pits or imperfections in the rock. Otherwise they can be left to add character to the finished work or actually integrated into the design. Some painters prefer to base coat their stone with gesso or one solid color before beginning work while others prefer to leave the surface in its raw state. With a pencil or chalk the basic shape of the animal can be sketched in. Never use marker pens as it won’t matter how many coats of paint are applied the lines will still bleed through. Paint can either be applied thickly or in many delicate layers in a watercolor technique depending on the effect desired. Fur is perhaps one of the most difficult effects to achieve as it takes practice to make a rock look “soft”. Once the stone is finished it should be left to cure for several days before being sprayed with a clear varnish to protect the work. This medium comes in gloss or matte but it is a matter of personal preference as to which should be used. For the beginning rock painter there are many excellent books containing patterns that can be copied. The American artist and writer Lin Wellford has written an excellent series of books with projects that are easily followed allowing even the most inexperienced painter to complete extremely sophisticated work. (Editor’s note: this series is highly recommended, please see Related Items sidebar.). For the more experienced artist it is easy to work from photos, either from their own collection or other sources. The disadvantage with this in the case of 3D work is that the painter must use their imagination to fill in the unseen sides of their subject. It is actually preferable to have several views of the same animal so that a more complete image can be constructed. Certainly the term “pet rock” has now taken on a whole new meaning. And apart from being beautiful they have many other advantages: they don’t shed their hair, they’re quiet and they cost nothing at all to feed! Author Jen Longshaw’s artwork has been exhibited within New Zealand and is currently in various private collections. Besides painting in watercolor and acrylic she uses pen and ink, often in the pointillist style. Her work can be bought as an original or as a limited edition print or card. Her subjects range from floral to animals with the bulk of her commissioned work being for pet portraits. Besides conventional 2D work Jen also paints in the round or 3D on rocks. Rock painting forms the major part of her output and besides undertaking private commissions her work is found in several retail outlets throughout New Zealand. Jen has Art for Sale here, and her web site Passion for Paint is well worth a visit. Copyright Jen Longshaw 2000-2014 Please do not copy in any manner without permission from the author.